This book includes more than 80 games to help you break down barriers, communicate better, and generate new ideas, insights, and strategies. The authors hav Great things don't happen in a vacuum. But creating an environment for creative thinking and innovation can be a daunting challenge. How can you make it happen at your company? The answer may surprise you: gamestorming. To ask other readers questions about Gamestorming, please sign up. Has a laundry list of useful brainstorming patterns. Book lacks real life examples of when things have worked, have not worked. Lacks any evidence that this work any better than anything else. Difficult to read as it's very dry. Definitely feels like some sections were added as fillers. Treat as reference for the patterns. If you facilitate workshops & meetings you should read this book. While the compilation of techniques is great, the biggest take away for me on a second reading is the framework and pattern-library-ish approach to that compilation. I'm certainly going to be re-thinking some of the work that I do in that context. Recommended. The best part of Gamestorming for me was the discussions of the principles behind "games." Just as they focus on the opening and closing exercises and how important they are, Gamestorming is most useful when viewed as an opener or a closer. The principles contained inside are useful for anyone looking to bring structure into their activities but left so vague that it is difficult to understand exactly how to put them into practice. They are most useful when taken as a part of the knowledge curve The best part of Gamestorming for me was the discussions of the principles behind "games." Just as they focus on the opening and closing exercises and how important they are, Gamestorming is most useful when viewed as an opener or a closer. The principles contained inside are useful for anyone looking to bring structure into their activities but left so vague that it is difficult to understand exactly how to put them into practice. They are most useful when taken as a part of the knowledge curve, and not a one-stop shop. The book is full of useful and practical information to help businesses from coming up with ideas, exploring options, to shipping products and getting to done. The main approach of Gamestorming is framing the meetings and exercises as games, with the rules spelled out, for example the number of players, objective of the game, and how the game is played. This is kinda brilliant since it gives a formal structure to a meeting without being too formal, plus it gets all participants informed on goals The book is full of useful and practical information to help businesses from coming up with ideas, exploring options, to shipping products and getting to done. The main approach of Gamestorming is framing the meetings and exercises as games, with the rules spelled out, for example the number of players, objective of the game, and how the game is played. This is kinda brilliant since it gives a formal structure to a meeting without being too formal, plus it gets all participants informed on goals and process of a meeting ahead of time. I got the Kindle edition of the book, which I think the physical copy would be better. The book is not that great to just sit down and read, since after the intro it's a list of different games on how to achieve an objective. With the physical copy so when you're ready to use the techniques you could flip through and see which ones you want to try. Gamestorming is a book about a problem you didn't know you had and a solution that you've unknowingly used since childhood. When problems have a clear start point and end point, the steps between A and B are very clear. If you need to get groceries, a check of the pantry, writing a list and a trip to the market gets you to your end goal. But, what if the end goal isn't clear? What if there are a range of possibilities? We face these sorts of problems every day and often try to use the same A to B Gamestorming is a book about a problem you didn't know you had and a solution that you've unknowingly used since childhood. But, what if the end goal isn't clear? What if there are a range of possibilities? We face these sorts of problems every day and often try to use the same A to B approach without much success. "Processes are rule-heavy. They prescribe a narrow range of activities and prohibit everything else. Games, on the other hand, are rule-light. In a game, anything not forbidden is permitted." The book provides over 80 games that can be used in generate ideas, explore ideas, and decide which idea move us closer. The book also describes the qualities games have so that readers can develop their own games to match the situation. Active readers of the creativity genre will see games inspired by Thinkertoys, Six Thinking Hats and brainwriting as well as the authors' commentary on what makes the versions of these games particularly effective. My original impression (before I've actually started reading) was - wow, what a great idea - a book about visual communication & ideation, how cool is that? Now I have the answer - far less cool than it could have been. Sadly, the 'games' presented in this book are extremely simple & ... obvious. Just to illustrate this - the most advance of them is the SWOT analysis. Yessss. In other words - a smart individual with a basic ability of abstract / model thinking (like an engineer) won't be My original impression (before I've actually started reading) was - wow, what a great idea - a book about visual communication & ideation, how cool is that? Now I have the answer - far less cool than it could have been. Sadly, the 'games' presented in this book are extremely simple & ... obvious. Just to illustrate this - the most advance of them is the SWOT analysis. Yessss. In other words - a smart individual with a basic ability of abstract / model thinking (like an engineer) won't benefit from this book at all. Maybe some others would. The start of the book is well structured where it explains the concept of gamification at work and how meetings can be more effective if they are more interactive. It also explains the game theory and how to open and close a game. The second part of the book was rather dull because it shows the games but you can't really apply them while reading. If the book is split to 2 books, it would give better experience to the reader. The first, elaborates more on the concept and the research behind the t The start of the book is well structured where it explains the concept of gamification at work and how meetings can be more effective if they are more interactive. It also explains the game theory and how to open and close a game. Gamestorming is an incredibly useful resource. But the instructions and timing of the games need some adjustment in practise. Like any resource, use the bits that work for you and adapt. We used to run a fortnightly collaboration club at work where we tried out a game and reflected on how and when it would be most useful. Very similar to the Agile Retrospectives book by Diana Larsen and Esther Derby. This book has a lot more activities and goes into some more detail on the theory of using games to get people interacting in meaningful ways. Several people around Gangplank have been using the games and are raving about them. I plan on using a few during a consulting engagement coming up. Great stuff. From time to time, I need to organise sessions with a group of people in which you need to take them to a place that is unclear for themselves and in most of the the cases equally unclear to myself. That is something that people feel really uncomfortable about. One of the ways to get a group of people beyond such a resistance point, is by using what I call a ‘workshop’. This is the point where this book fits in perfectly. The book explains in the beginning chapters beautifully how the structure o From time to time, I need to organise sessions with a group of people in which you need to take them to a place that is unclear for themselves and in most of the the cases equally unclear to myself. That is something that people feel really uncomfortable about. One of the ways to get a group of people beyond such a resistance point, is by using what I call a ‘workshop’. This is the point where this book fits in perfectly. The book explains in the beginning chapters beautifully how the structure of moving a team from one know place to another less know place works. It then gives in the following chapters a ton of ‘games’ that you can use to construct a journey that might work for your group. The book starts with a short but great opening about gamestorming and how it is a method for exploration and discovery of unpredictable, breakthrough ideas. The authors give us some pretty inspirational foundational aspects of gamestorming and its importance in the "age of discovery". The remaining vast majority of the book is a list of games that teams can play to generate, categorize and prioritize new ideas. Some games are interesting but too many are similar to each others. It would have been The book starts with a short but great opening about gamestorming and how it is a method for exploration and discovery of unpredictable, breakthrough ideas. The authors give us some pretty inspirational foundational aspects of gamestorming and its importance in the "age of discovery". The remaining vast majority of the book is a list of games that teams can play to generate, categorize and prioritize new ideas. Some games are interesting but too many are similar to each others. It would have been nice to organize them by broader patterns or mechanisms instead of organizing them loosely in three big sections called "opening", "exploring" and "closing" games. The book would also have benefited from adding a few examples of gamestorming sessions with more detailed about how interactions usually go with participants, what kind of ideas were generated, etc. Nice, well-written book with lots of interesting content. The book presents a series of "games" that can be done to solve certain issues, such as prioritizing tasks, getting input and feedback from groups, starting or closing discussions, brainstorming and many more. Sadly, I found it far too "business-oriented" for me. I mostly work alone in a creative field (game development) and a lot of those felt like they were clearly designed for office workers or large groups. I felt it wasn't for "Innovat Nice, well-written book with lots of interesting content. In this fast-paced moving world, every organisation needs creative ideas for constantly re-inventing and innovating. This book is like a directory that contains tools that foster creativity in a team, helps in team building , collaborating , brain-storming and strategizing in order to achieve desired goals in a specific course of time keeping play at the core of it. This book gives a fresh perspective about game as play which brings out the essence of our innate childlike attributes that is prese In this fast-paced moving world, every organisation needs creative ideas for constantly re-inventing and innovating. This book is like a directory that contains tools that foster creativity in a team, helps in team building , collaborating , brain-storming and strategizing in order to achieve desired goals in a specific course of time keeping play at the core of it. It contained some interesting methods for brainstorming. 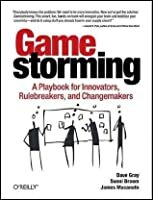 I know it was called gamestorming, but almost all the techniques were ones that I have seen used during brainstorming events over the last several decades. Still, it was well written and I haven't seen this many brought together in one book. I do recommend it as a useful resource for anyone thinking about how to get their organization to brainstorm and work through new ideas, urgent issues, or ongoing problems. A good reference for team brainstorming exercises, especially for offsites. The book begins with a description of what comprises a game. The remainder desttibes 50+ ideas for idea generation, visioning, and planning. The index is great for finding an activity and planning an agenda quickly. This is a great handbook for everyone who organizes team meetings, brainstorming sessions, or any other form of idea generation and problem-solving in a group. My advice: don't borrow, buy it! Do a quick read through to get an idea about the games and then consult it before the start of your meetings to find the perfect game to use. We all know that life can not be a game, right?yes..but Games are part of it. And sometimes to understand life more, we have to PLAY, because life can be Fuzzy. And a fuzzy needs the one who undesransnds it. A book that is an amazing reference for gamers. Some great ideas for meeting exercises. Really awkward to read as an e-book on my phone, but my paper copy is a great reference to take to meetings. Pretty great for a book with pictures! I really liked some of the ideas in this book, but felt that others weren't that helpful. Overall a very easy way to think about how to solve problems at the jerb. A somewhat boring validation of my work engaging people with tabloid sheets, scented markers, and sticky notes. A nice resource for public/community engagement practitioners. Bonus star for inspiring me to sketch more (see validation above). This book is made for visual thinkers and design facilitators. A toolkit to help teams synthesize, align or create.